Shipments with multiple packages sent to the same destination can be grouped together in a multi-piece shipment to save money. Multi-piece Shipments on Shippo are only supported by FedEx, Newgistics, and UPS at the moment. Do you need it for another carrier? Let us know at support@goshippo.com. To create a multi-piece shipment, simply add a list of Parcel objects to the parcels field in a Shipment. Generating rates and creating transactions works the exact same way as with normal shipments. The limit on the number of parcels depends on each carrier’s restrictions. As usual, the Shipment request will return a list of Rates for you to select from. The Rate amount refers to the cost of the entire Shipment with multiple packages, not per package. You can purchase a multi-piece shipping rate by POSTing the Rate object_id to the Transaction endpoint as usual. A separate transaction will be created for each parcel. You can also create multi-piece shipments in one API call. Check out our tutorial for single label call creation for more details. The POST request returns the master Transaction object in the response. In order to get labels for all the parcels in the Shipment you need to filter for each parcel transaction. The Transaction response after you’ve purchased the rate provides you with the master tracking_numberof the entire Shipment and the label_url for the first parcel of the Shipment. As an example, this label has the master tracking number on it incl. information about the status of the entire multi-piece shipment. To retrieve labels for the rest of the parcels in the Shipment, you need to make another GET request to the Transaction endpoint with the Rate object_id as the query parameter. 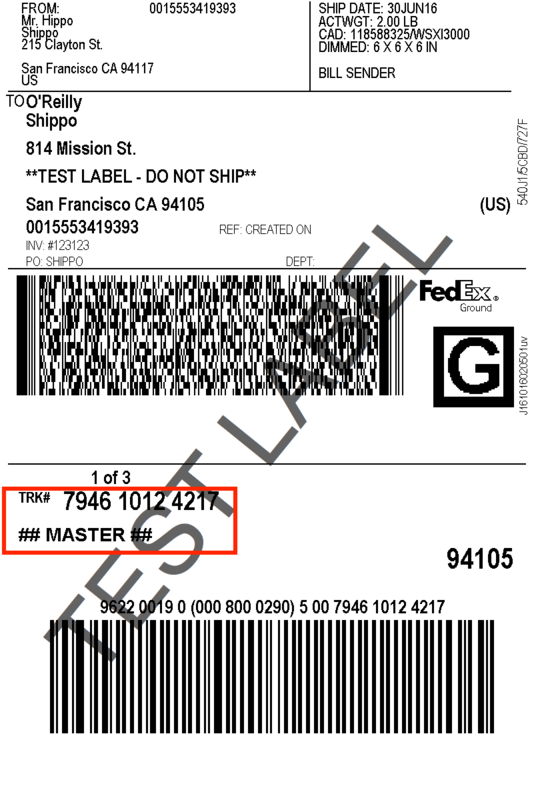 These sample labels have both the master tracking number on it as well as their own parcel-specific tracking number. The API will respond with a JSON serialized list of the transactions that belong to this Rate. Each of these transactions belongs to exactly one parcel of the multi-piece shipment. Each transaction has a unique tracking_number and label_url field for it’s associated parcel. If you have more than 5 transactions that belong to the Rate, the response will be paginated. You can also purchase insurance for each package of the multi-piece shipment. This can be done through the extras attribute when creating your Parcel object within the Shipment request. Here is a sample request for a Shipment with different insurance amounts for each Parcel. If both shipment-level and parcel-level insurance are specified, the parcel-level insurance will take precedence. Parcels without parcel-level insurance will have the shipment-level insurance amount applied to that parcel. If only shipment-level insurance is specified, then the shipment insurance amount will be applied to each parcel – not divide amongst parcels. FedEx and UPS offer Cash on Delivery (C.O.D.) for individual parcels in a multi-piece shipment. You can specific your C.O.D. preference in the extras attribute of the Parcel object when creating your Shipment. C.O.D. is only available for FedEx Ground as FedEx Ground packages can be delivered at different times. FedEx Express shipments can only accept C.O.D. on a shipment-level, which can be added under extras attribute of the Shipment object.